Show and Tell is at 10am on the first Saturday of every month - We'd love to have you join us! 5th Saturday Challenge is at 10am every time we have 5 Saturdays in the month. Next one is Saturday, December 29th! If you are up for a creative challenge, we'd love to have you join us. Call (603)444-5284 with questions, or to RESERVE YOUR BAG! Make anything, add anything, use everything. On the first Saturday of every month we gather in the classroom at 10 a.m. to show what we've made and get updated on all classes and events coming up at Stitch! Come join us and get a raffle ticket upon entry for a chance to win some fun prizes! 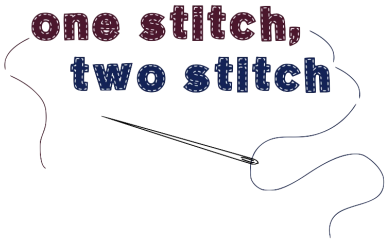 One Stitch, Two Stitch offers classes for all levels; from beginning sewers to advanced quilters, everyone can find a place in the Sew-Cial Club! If you don't see what you want, let us know - or grab three friends and we'll arrange a class especially for you. Free Open Sew - Come in and use our classroom and tools whenever we do not have a class scheduled - most Mondays. There isn't any instruction offered during this free time. Bring your project and machine and get 'er done! Please call and make sure we have room for you to spread out. (603)444-5284. ​3rd Sunday of each month at 1:00pm.. Please join us! We are really quite a charming group. Every month we get a pattern and new charm packs to work with - call or come by for more information. Cost is $40 per session or 3 sessions for $110. Spread your sewing wings and fly along with us! Let Beth know a week in advance if you'd like to try just one! On the 3rd Wednesday of every (except November) month, we get together and make quilt tops using our stash and scraps! Each month there will be a pattern, a Sew-Along, and if we are really lucky a slice of pie, all for just $15! If you would like to cut at home, please come by and pay for your class and pick up your pattern ahead of time, so you will have complete cutting instructions. We will begin the class at 10:30, but you are welcome to cut and sew for the rest of the day.